Dadu Dayal Jayanti- Dadu Dayal Jayanti Festival in India- What is Dadu Dayal Jayanti Festival. In every culture and society there lived some people who throughout their lives used to teach humanity and the real meaning of life. One of such people was Dadu Dayal who with his songs taught human being the real essence of life and encouraged people to understand what life really means. His words were very simple but with a great meaning. Centuries have gone in between but till today the significance of his preaches has not been faded with time. Till date his teachings are influential among the people for his inner look to life and the understanding of real ‘Atma’, the self. Born in the 15th century in Gujarat, Dadu Dayalji later came to Rajasthan. Throughout his life he taught human being the purpose and meaning of existence. His concept was close enough to the ‘sufi’ ideas where human being is given the utmost importance. Even though he was brought up in a Hindu family he did not believe in idol worship. One can find a resemblance of his thoughts with other great saint of the time named Kabir. Music to him was a way to convey his message to the common people in an effective way. That is the reason he composed more than 5000 songs that carries the soul of his teaching till date. In his poems he used different imageries to make people understand his vision and using of this imagery is the focal point of ‘sufi-ism’ or ‘sahajiya’ way of thinking. 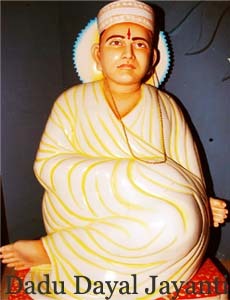 Little by little Dadu dayalji, the term which in local language means compassionate brother, attracted disciples who took an important role in spreading his teachings. Later it was known as ‘dayal panth’ or sect who followed the teachings of Dayalji with their lives and living. His idea was above the small boundary of cast and religion. With time the great teachings of Dadu Dayalji have not lost its appeal to the common people. In the state of Rajasthan and Gujarat there are still people who follow the way of life taught by Daduji. In a time when the society is facing the serious problem of violence, communalism and casteism the secular thought of Dadu dayalji Maharaj is quite applicable. When a Muslim emperor like Akbar was follower of this Hindu thinker it is really understood the truth of his preaching. That is why Dadu Dayal Jayanti is still celebrated on 14th of March of every year. This proves the relevance of his thoughts. All the information given above are of general nature only, collected and reproduced for the general information only. However, if you want some specific, exclusive and deep information, you may avail our specially designed services, for satisfying your thirst of knowledge.